I’ve figured out your new favourite way to have chicken. 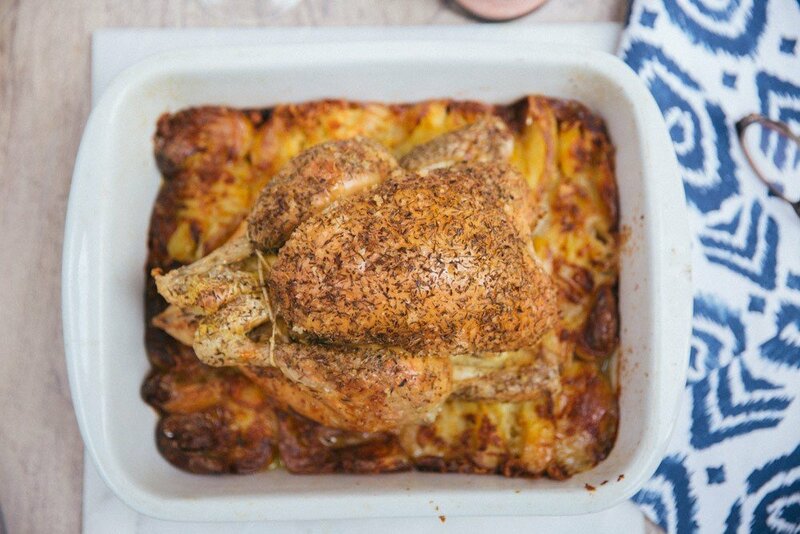 Perfect, golden, plump roast chicken sitting pretty on a nest of unparalleled potatoes. Crunchy edges, fluffy middles and gooey-sauce-soaked bottoms. So packed with flavour you wont know what to do with yourself! What’s more, it’s the laziest recipe you could hope for. With minimal prep you’ve got yourself a showstopper. Pre-heat your oven to 190C/380F and boil your potatoes until you can slide a knife into one with ease. While they’re bubbling away, put a roasting dish into the oven to heat up. Chop a lemon into quarters and stuff into the cavity. Follow with 1tsp of honey, a hunk of butter and two peeled cloves of garlic. The order they go in is upto you. Rub a generous amount of olive oil all over the skin and follow with lots of flaked salt, pepper and your herbs. I just used thyme this thyme, as I’d run out of everything else! Once your potatoes are cooked, drain them and pop to one side. Carefully remove the hot tray from the oven and place on a heatproof surface. Pour in a glug or three of olive oil. Clearly my table needs leveling! Tip your hot potatoes in (taking care not to splash that hot oil). Using a fork or a masher, crush the potatoes. Just gently, we just want them broken up a bit, not mashed. When they’re all crushed, place the chicken onto its nest. Roast for about 1.5 – 2 hours (depending on the size). If you’re unsure, cut into the meat. If it’s all white without a trace of pink, you’re golden. Serve up with any sides you fancy, I generally go for a nice simple salad and a bottle of something chilled. Also truffle mustard, which will change your life! Get some! Carve it up at the table and all of the juices will run into the crispy nest. Saucy! Tuck in and let me know what you think! But be warned, you’re never going to be able to look at another roast chicken in the same way.